Stealing is stealing! Period. Don’t disguise Plagiarism as Appreciation. This post is about creative effort. It’s about the ownership of content. It’s about calling a spade a spade and a thief a thief. This post has been triggered by my friend Barb’s post here. Artists, writers, music-composers – all those who earn their living through creative effort have felt the pain of their work being stolen. There was a time when I used to wonder why otherwise “honest” people are quick to steal the creative work of their fellow-beings; why people who’d never, not even in their dreams, steal a watch, a cellphone, a diamond ring, or money – would quite readily pounce upon creative content and present it as their own. But that was another time, another era. Since then, through many such misfortunes of my own, I’ve discovered why. Why People Steal Creative Work? 1. The Quality of Creative Work is Subjective. I may say that James Bama or James Christensen are better artists than M.F. Hussein or Andy Warhol, but there are hundreds of thousands out there who’d verbally slash me into ribbons for saying so – and they’d have a more objective reason to counter me – the quantum of commercial success. When quality of the output is subjective, everyone wants to be there and do that. And people who steal aren’t really the connoisseurs – they are those who just assume that all art is equal and available in abundance, and that if they steal an artwork, they are in fact, putting their stamp of approval on the artist. In fact, they presume that artists must be grateful for the attention. 2. Artists don’t/can’t fight back. They don’t because the environment has trained them to be at the receiving end, just the way others are trained to think of artists as good-for-nothing bums who are just waiting for someone to notice their work and drop a penny in their bowl. They can’t because most artists whose work gets stolen are not famous and rich yet – and so they don’t have the means to drag the thieves to the court and make them pay. Have you ever heard a famous singer’s work being plagiarized in his or her own country? It doesn’t happen. But across borders, the thieves find their nerve, because law is often biased to favor the citizens of that country. And so the cross-border art-thieves are safe. In some cultures, copying isn’t stealing. Parents help the children trace, they help the children by drawing/writing for them, they even help the children change a few lines here and there so that the artwork appears to have been drawn by the child. The child grows up with the belief that copying isn’t stealing. Unfortunately, in art, in music, and in literature; IT IS! Rote learning is, in a way, learning to copy and learning to accept that copying is moral and legal. When a fourteen-year old learns an explanation of a passage by rote and regurgitates it on his examination answer sheet, only to get a perfect score, he also learns that creativity is crap. Stuff has been stolen from me all my life. Some of the things were material and I don’t recall most of them, but some were created with my sweat and pain, and I remember all those quite well. Among many such robberies that shredded my faith in the integrity of my fellow human-beings, here are three such incidents – going backwards in time. One of my artist friends once remarked that we shouldn’t waste our energy on trying to stop the scum from stealing, instead, we should focus on creating. I’d like to ask the artists who believe that there’s no need to fight back – if someone stole their car, would they be as willing to step back and let the thief have it, as they would if someone stole their art? Stripping a creative work of the credit and using it – is stealing. Period. A little more than a year ago, one of the most prominent newspapers here (this publication also happens to be one of the largest circulated English daily newspapers of the world) , carried a caricature that I had done three years ago. My credit, my signature, all neatly cropped off. It was presented in a manner that it cast the impression of having been created by one of the caricaturists that caricatured the guests at a restaurant featured in the newspaper. It didn’t just hurt me, it also hurt all those who went to the restaurant hoping to get a caricature in the style and quality that was mine. But that shouldn’t hurt me, right? After all, who am I to say that the caricaturists hired by the restaurant at possibly a measly $10 an hour weren’t better than me? Remember point 1 in the first list? The quality of creative work is subjective. I wrote to the editor…she sweet-talked, then she tried to pin the responsibility on a junior editor, next on an external party – never once apologizing. I was willing to let the matter go, she only had to accept and apologize. So I gave up and wrote to the Managing Director of the Publishing House. I never got an apology, but those I know in there, told me that she did get pulled up for it. Not apologizing doesn’t mean that it wasn’t stealing. It was, and it will remain. Period. When I was in eight-grade, I used to draw pictures (generally, figures with decorative borders) and sometimes leave them between the pages of my books. A teacher, let’s call her SB (those are her actual initials,) borrowed my book so that she could ask us to read the passages from the book. From my place on the first bench, I saw her open the book and surreptitiously drop that sketch in her desk drawer; my friend saw it too. I felt sad, because it was a rather nice sketch and I wanted to go home and show it to my father. Nobody said anything, but the whole class knew that our teacher was a thief and she stole from the kids. People who tried rationalizing this for me, told me that she did this because she liked my work, and that I should take it as a compliment. So, if you like someone’s wife, steal her, because you are just paying a compliment to the man. If you like someone’s pen, pilfer it, because you are merely expressing your appreciation for the pen. Because your morality tells you that it’s not right. Because you know, that you cannot clad the act in the cloak of appreciation. In truth, when my teacher took my drawing without asking me, she stole. Period. In truth, when you take a creative work and make it look like you did it, you steal. Period. Because you know that it’s immoral. It’s like saying that you fathered another man’s child. You wouldn’t do it. Would you? There was a time when cartoons were made of squigglies put together…squigglies that won’t have meaning unless they were supported by oodles of text in form of captions. Then in 1926, a child was born in Goa and he was given the task of banishing the ugly squigglies from the world of publishing. This child was Mario Miranda, who didn’t need to go to an illustration school to master the art of creating riveting characters that spoke to you without words. The words merely embellished his already rich creations further. With a heavy heart but with tons of gratitude, I present the caricature of Mario Miranda, one of the very few Indian artists who have left behind characters that will always remind us of him. Mario Miranda (1926 - 2011) with his characters. In this caricature, most of his fans will be able to identify B.C. Bundaldass, M.C. Moonswami (Bundaldass’s handyman or “side-kick” as Mario used to call him) (I wonder what the B.C. and the M.C. stood for? – Scatological…eh?!) Ms. Rajini Nimbupani (the voluptuous actress,) Ms. Fonseca (the polka-dots-dress-clad secretary with an hour-glass figure,) the loveable little dog. I made a post about Mario Miranda on June 14th, 2011. In this post, I also mention that the other Indian cartoonist who makes me feel like becoming a cartoonist, is Ajit Ninan. The Times of India today carried Ajit Ninan’s tribute to Mario Miranda. Quoting Ajit Ninan from TOI – Page 10 – December 13, 2011. “Mario’s work touched the heart. His characterisation of people, particularly the weakness of the male of the species, was superb. He brought home to you the foibles of man through gloriously detailed illustrations of life in the office, on the streets and above all at parties. I am convinced that as I write this, Mario Miranda is busy attending parties in heaven, and that his illustrations will shortly be published in the Illustrated Weekly of Heaven. Caricature/Cartoon of Ajit Ninan – The Great Indian Cartoonist. Presenting Ajit Ninan, the Indian Cartoonist who breaks all established standards of quality in cartooning. I foraged the web to ferret out some information on Ajit Ninan, but returned empty-handed. I don’t know when he celebrates his birthday, I don’t really know a lot about his early life, and except for a few details, I know nothing about his professional life. 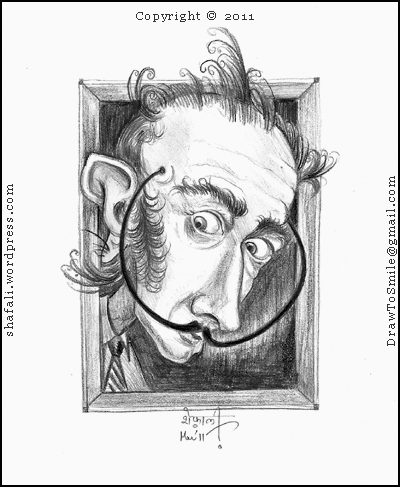 So what does the Caricaturist do when faced with a blank page? She closes her eyes and lets her thoughts travel into the past, where she sees a young boy with a dimpled smile, who would become the Ajit Ninan whose drawings tell her that there are people who refuse to kill their skill – come what may. Here’s the story of this little boy, who became one of the two Indian Cartoonists who’ve made me experience both pride and joy in equal measures. He loved the afternoons. Hyderabadi afternoons were scathingly hot during this time of the year but the heat didn’t deter him from enjoying them. He’d walk back from school with his friends, feeling under the hot glare of the Sun on his brow, his arms, and his spindly legs only half covered by the shorts of his school uniform; but he always looked forward to the afternoons. They were his to do whatever his heart desired. Deep inside he felt that whatever he might end up doing all his life – these afternoons would remain etched in his memories forever. This was one of those unforgettable afternoons. Ajit had returned from school, and after a quick snack of Idiyappam that his mother had made for him, he was now lying on his stomach, with his feet up in the air – letting the coolness of the marble floor seep into his body. His sketchbook lay open in front of him and propped upon his left elbow, he drew in it feverishly. He had wanted to finish the drawing of that toy car before his father arrived home from work. He looked over his shoulder to check the clock in the living room. It was past four already! He returned to his drawing, and then drew away to look at the whole picture. What should he do with wheel? Should it be a little bigger? Would it look funnier if he made it bigger…a lot bigger than the other one? So when he heard his name being called in his father’s loud but stern voice, Ajit almost jumped out of his skin. The drawing pencil shot out of his hand and landed under his table that was set near the window, and his sketchbook lay open on the floor – the proof of his being a wayward son. “Doesn’t look like nothing to me,” his father took a step forward. Ajit shrunk away. He wished he had listened to his intuition, but then his father never came home early. What was different today? And then it clicked. His parents had to attend a wedding today! While Ajit’s revved-up mind was busy figuring out all this, his father had picked up the sketchbook. Ajit held the edge of the table to steady himself. This was going to be one of those days. “You made all these?” His father asked. Isn’t it obvious? It’s my sketchbook, isn’t it? Ajit thought. “Tell me. How will you ever become an engineer, if you go on neglecting Math for these…these…” his father struggled to find the right word. “Drawings?” Ajit couldn’t stop himself from supplying the word, but regretting it immediately after. “Drawings. Yes. You are good at making these – and this skill will help you a lot when you study engineering. These tractors, these jeeps, these pumps…” he continued as he flipped through Ajit’s sketchbook, while Ajit waited for the tirade to end. It ended, as always, when his mother intervened. Oh, how he loved her. She was the only one in the whole family, who truly supported his love for drawing – but even she fretted about his future. If only he could prove them wrong. Later that evening, as Ajit sat at his table near the window, absently trying to resolve those improper fractions into proper fractions, random pieces of conversation floated in from his parents’ bedroom. Ajit turned his attention to his notebook. Those fractions kept changing into cartoon characters. Why? Didn’t 2 look almost like a serpent and the number 8…he found himself doodling two meshing gears into the 8! The “black sheep” of the family. That had to be his uncle Abu Abraham. He worked for this American Publication called the Guardian, but he was shortly returning to India. Abu’s atheism and the way he thumbed his nose at traditions had ensured his symbolic ouster from the family. His whole body tensed up in anticipation as he waited for them to leave. Ajit’s parents were going out for a Punjabi wedding, which meant that they’d not return until late in night. He could now look forward to many hours of unadulterated drawing pleasure. I couldn’t find his biography, so I tried to glean whatever information I could from a variety of sources, especially from this post by Abhijit Bhaduri. Here’s the sum total of my learning. Ajit Ninan was born in Hyderabad in 1955. His parents were from Kerala though. Ajit studied at Hyderabad Public School where he manipulated his way into the library, so that he could go through the Cartoons in magazines. When he was young, he prefered to draw mechanical drawings, which I presume, must’ve made his father believe that his son wanted to become and engineer when he grew up. Fortunately Ninan wasn’t good at Math (I say fortunately, because had he been good at it, he’d have ended up becoming an engineer; which would mean that India would’ve lost one of its few great cartoonists,)so he studied political science, and became a political cartoonist. Ninan published in first cartoon in Shankar’s Weekly, a magazine that his equally illustrious uncle Abu Abraham also drew for. Ninan’s Inspirations include Mario Miranda, James Thurber, and Arnold Roth (he used to spend his precious out-of-class-in-the-library hours poring over the drawings of JT and AR.) Ajit Ninan worked with India Today as a Cartoonist and an Illustrator. He then moved to The Indian Express. He currently works with The Times of India as their Group Art Consultant. Here are some interesting links for you to follow. Ajit Ninan’s Caricature Album at Indian Caricature Site. Ajit Ninan received the Lifetime Achievement Award from President Kalam. Ninan at work (September 9, 2009) – Ajit Bhaduri’s Flickr Stream. 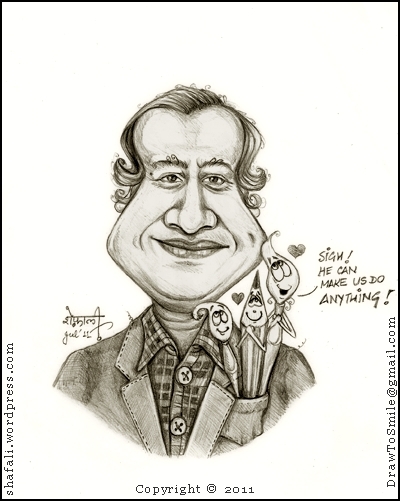 What this caricaturist has in common with the Great Ninan? Just heard the news…The Great Cartoonist Mario Miranda passed away today. 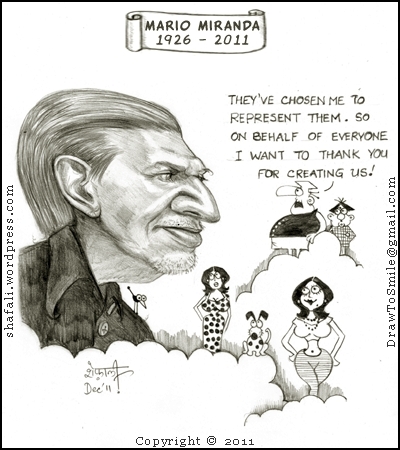 He will remain an inspiration to many generations of Indian cartoonists and illustrators. In this caricaturist’s list, there are two Indian cartoonists of note and one of these two is also a caricaturist. These two, and only these two artists make me look like a glazed-eye zombie when I look at their work. Only these two remind me that not everyone is willing to let go of the skill of drawing after finding a job. I have obviously not seen every Indian newspaper published in every Indian language, so there might be random lights of talent shining elsewhere too. But of whatever I have seen, these two have made me, the jaded and faded caricaturist, experience a strong need to write a couple of posts in their honor. You already know that the first name on this short list, is Mario Miranda…the second is Ajit Ninan. In this post, let me introduce you to the astonishing work of Mario Miranda. Wait a minute. Let me find my artistic aptitude. It was lying at the edge of my table when I last saw it…it must be here somewhere. Oh…it’s here – on the floor! It must’ve somersaulted off the desk to avoid commenting on Mario’s work. I mean, how do you comment on a Master’s drawings? I will keep my promise and tell you what I feel about those highly detailed, cleanly drawn, stylized cartoons – but before I do that, I’d like you to look at his work at the following links. Style (Mario has a style of his own. A cartoonist whose work you can recognize while standing 10 feet away from his illustration, is a rarity – not just in India, but in the world. His lines are usually curves, and his lines always end in a strong black dot. He drew a lot of whatever he saw around himself including dogs (a dog-lover? another reason for me to like him); but then as it happens with almost every young man in our country, he too was swayed by the Ambassador Car with the red revolving lights, and tried to become an IAS officer – but thankfully his inner calling screamed at him and pulled him away from that mundane pursuit. He ended up working in an ad-agency. I can realize how painful the ad-agency stint must’ve been for him, but then his inner calling was all tuned up and in fantastic shape, so it screamed at him again, and he found himself working for the Illustrated Weekly of India. The Times of India, which had not selected him earlier, rebounded to him after they saw his work in the Weekly, and soon he was working for them too. Then of course, he returned to India – back to The Times of India and to another Indian legend of Cartooning, R.K. Laxman, who he respected a lot. Read Mario Miranda’s interview by Romola Butalia here. Also check out “Cartooning Not Funny: Mario Miranda” here. My Childhood Love – A Naked Truth – A Caricature of Life! This isn’t the usual fare that’s served at this blog. If you’ve arrived here through a search and if you are looking for caricatures click the Gallery link and if you are here for the Story-in-the-Caricature Blog Carnival, click here. However, if you are looking for nothing in particular and if for some unfathomable reason you care about the beautiful unique relationship I share with Pratap Mullick, read on. There’s a good chance that you know neither about Pratap Mullick nor about me, but if you are an artist who grew up in the far-flung regions of India, where if you wanted to buy a magazine, you’d have to travel about 40 miles – you probably have seen Pratap Mullick’s art. When I was a child, I was not just a child, I was a girl child; and despite being born in quite an emancipated family, nobody thought to ask me what I’d like to become when I grew up. Until I was ten, school was a mercurial affair – it was there, then it wasn’t, then again…it was there, and then it wasn’t. We often lived in places where ours was the only family for miles around. So I had a lot of time to read what I wanted to instead of reading what I had to. Once a month, my father would take us to the nearest town, and I’d spend my monthly pocket-money (5 Rupees) on comics. I’d buy some combination of Indrajal comics (1 Rupee) and Amar Chitra Kathas (1.50 Rupees, if I remember right.) Indrajaal comics distributed the Phantom comics and the Mandrake comics in India – they later created their own hero, Bahadur too. In contrast, Amar Chitra Kathas (translates to: Immortal Stories with Pictures,) had stories from Indian Mythology and History. After a few months of buying both, I decided that I preferred Amar Chitra Kathas, so I requested my parents for an increment of one rupee in my pocket-money and began buying four Amar Chitra Kathas instead. It was then that I realized that some of the Amar Chitra Kathas had drawings that were considerably better than those in others. As I mentioned in one of my previous posts, I was a selectively curious child. For a long time, it didn’t occur to me that real artists made those drawings, and I never thought that I could one day illustrate for books and magazines. I drew because it was nice to draw. Coming back to the point, I realized that certain drawings looked better – in fact, they looked beautiful. They inspired me to draw better. Without realizing that I was learning from those drawings, I began to learn. I learned about proportions, shades, backgrounds, perspectives…I looked at those drawings and then looked around – and then I’d try to draw what I saw, the way they were drawn in those drawings. I still didn’t know that there was an artist behind those drawings, so next when I went to the town and shopped for Amar Chitra Kathas, I’d look inside, check out the drawings, and instinctively select the Amar Chitra Kathas with those beautiful drawings. My parents would wonder why I selected some and rejected some – but they never asked and I never told. It was my secret. When kids grow up, they are often asked what they’d like to be when they grew up – in my time, a girl child was seldom asked this question – and so I never could connect art with illustration. If I were asked the question, I might’ve said something like – I would like to draw…and then one thing could’ve led to another, and I might’ve ended up becoming a “real” artist. But for this reason or some other, there was a mental gap somewhere – some synapses didn’t connect – somehow I never realized that art could be a profession as well. But I was a different Shafali now. I knew that a real artist did those illustrations, and so with my heart beating hard against my ribs, I checked out the cover for the credits – expecting to find none. (Our publishers often fear that they’d lose their illustrators and so they don’t provide credit to the artists.) But there it was. It said: “Illustrated by: Pratap Mullick”! For the first time, I knew the name of the man who had held my hand and steadied it as I learned to draw – for the first time in my life, my thoughts went beyond those drawings and I visualized what his life must’ve been – for now I also know a lot about the struggle that life is for an Indian artist. It was a moment that was both happy and sad. The fact that Pratap Mullick could survive in this world and that he made drawings that’d survive him – made me happy. The fact that a man of his caliber, wasn’t celebrated – wasn’t known – and wasn’t given the status he deserved, made me sad. I should’ve heard his name as one of the great artists of India – he changed lives, he helped people learn art, and he still remains the best book illustrator that India has ever seen – and believe me when I say that because I spend hours looking at illustrations…and just one illustration is what it takes to tell you what an artist is worth! As someone who’s keen on art, I wonder why an Amar Chitra Katha that he illustrated should sell at the same price at which all other Amar Chitra Kathas would sell? The comics he illustrated are collectibles – the comics that others did…well they just earned their living! If you don’t know what I am talking about buy “Vasantasena” and “Vasavadatta” – and compare them (Don’t go by the cover illustrations…they are always done well.) ! I just hope that he was at least paid better. The question is – Why do we normalize? Why do we pull real talent down to the level of mediocrity? Three Great Artists of the Twentieth Century – James Bama, James Christensen, and Boris Vallejo! work – that’s the art I love. So here it is – in black and white – as usual. I dislike art that celebrates an absence of skill and that smacks of an organized art-racket. I don’t like irregular patterns created through a mindless splash of colors. I don’t like geometrical shapes (circles/squares/rectangles/hexagons, even irregular shapes…) filled with solid colors – ending up in a random title for the canvas. I don’t like negativity projected through a crazy array of cuttings, pasted together in a haphazard arrangement. I hate art that makes me feel like an idiot – that makes me say that my neighbor’s five-year-old could’ve done a better job at it. Art that feigns creativity, gives me creeps! I love drawings and paintings that establish a logical path to the artist’s thoughts. I admire art that makes me wonder whether it was a celestial being who created it. I appreciate art that tells me that the artist didn’t think that his audience was made of morons…and so he or she worked hard at the creating it. I love to see colors that complement one-another, and that have a reason to be there in the painting. Art that celebrates the human ability to improve the perception of God’s creations, makes me smile. Now you know the art that I hate – I’d mention neither those artists, nor their artwork on this blog. The art that I love and the artists that I revere, are made of pure titanium. Nothing can corrode them – our praise or criticism means nothing to them. They aren’t even swayed by Sotheby’s and Christie’s. I open myself to you by listing three of my favorites! These three have struggled to keep the beauty of art alive. These three are known well in their own arenas, but the success that should truly have been theirs went to those in my first list! But it didn’t matter to them – they’ve stuck to their love of skill in art. But then his art became my tutor – it helped me understand lights, shades, and textures; the way no book could! I was blissfully unaware that an artist as colorful and as imaginative as James C. Christensen existed, until one day, rummaging through an old-books sale, I came upon his book, “A Journey of the Imagination: The Art of James Christensen“. The book turned my world upside down. The images made me wonder how he must’ve created them. The concept, the visualization, and then the execution of each painting was done with such finesse – They looked like they were created by fairies! And yes, I also wondered why that beautiful book filled with unbelievable artistic treasures was available for me to buy at about 3 Dollars – and why people preferred to buy cheap calendars instead of picking this book of gold! Thank god they didn’t – or I wouldn’t have experienced the pain and the ecstasy of knowing Christensen’s work. About Boris Vallejo’s fantasy art! When it comes to fantasy (and sometimes work that borders on erotica,) Vallejo is the best. He works with dragons, castles, men, women, lights, and shadows; like nobody else. His work takes you away into the land of fantasies – it dissolves your reality through its fantastical realism, and it weaves a golden web of almost unreal realities around you. I learned to appreciate Vallejo, about a decade ago, when I did some RPG illustrations, and haven’t stopped since. That’s all, friends! Step into a world that’s different, and experience art that’s supported by a skill honed over a life time. Begin your journey from the appreciation of artistic mediocrity to that of artistic excellence!